Boost the volume of songs. Easily. MP3 amplifier lets You amplify MP3 files on your phone quickly and easily! So you already set the volume to maximum, bought those cool headphones, but volume on your music or ringtone is still not loud enough? The solution might be as easy as amplifying those MP3s in question. This simple application does just that, in 2 easy steps! This app can boost the volume of your music or other MP3 files up to 8x louder! 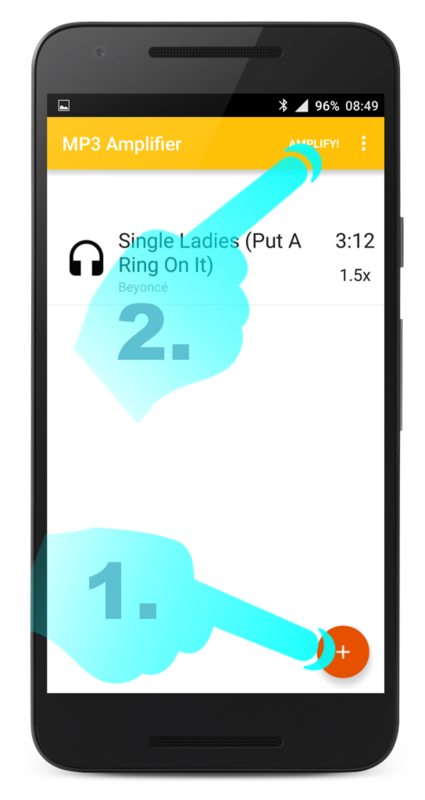 Imagine the following: You are trying to get more volume when playing music from your phone or Android device while the volume control is all the way up. Is there any way to increase the volume output? Use our MP3 Amplifier app for free! You have questions about using the app? Find Your answers in our How To Amplify section. Try MP3 Amplifier NOW for free!